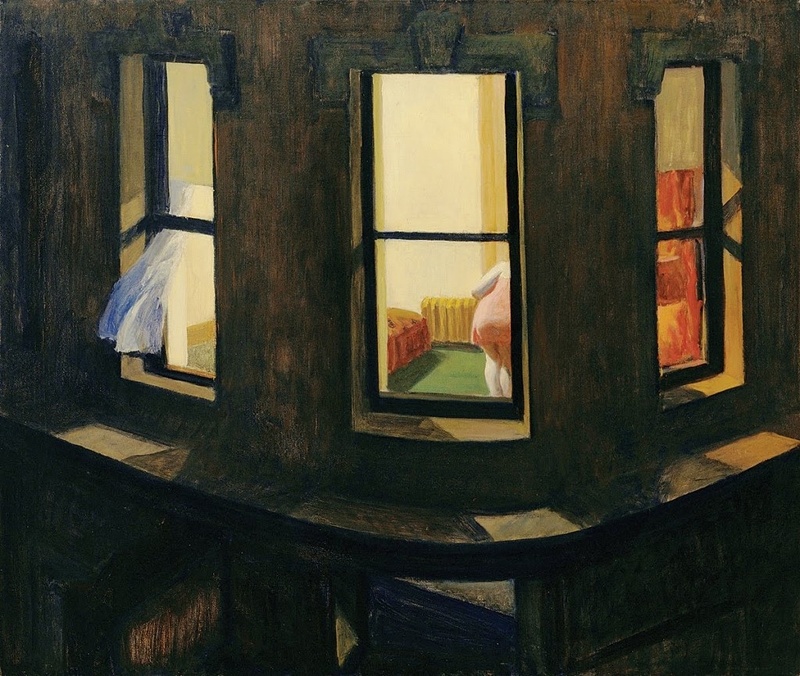 Few artists convey the disquieting solitude of city life like Edward Hopper, as he does here in “Untitled (Rooftops)” from 1926. It’s a stark, isolating view of flat, impenetrable Brooklyn rooftops and a lone figure brushed by light in a neatened bedroom. Is she reading? Contemplating? Or perhaps she’s looking down on the sidewalk, anticipating a guest’s arrival. Where in the city is this row of brick buildings? But could this really be on Seventh Avenue? 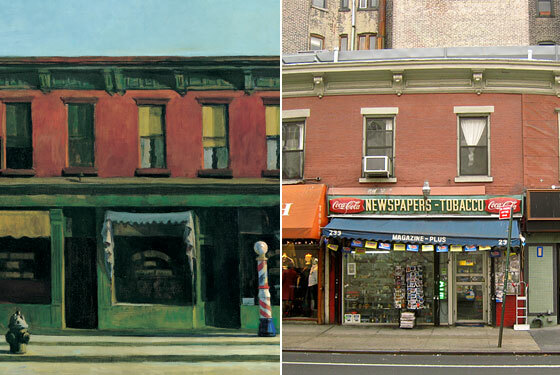 Not according to a 2007 report from the Greenwich Village Historical Society, which explains that the distinctive cornices, barber shop pole, fire hydrant, and morning shadows place the inspiration not on Seventh Avenue but at 231-235 Bleecker Street, just west of Carmine Street. 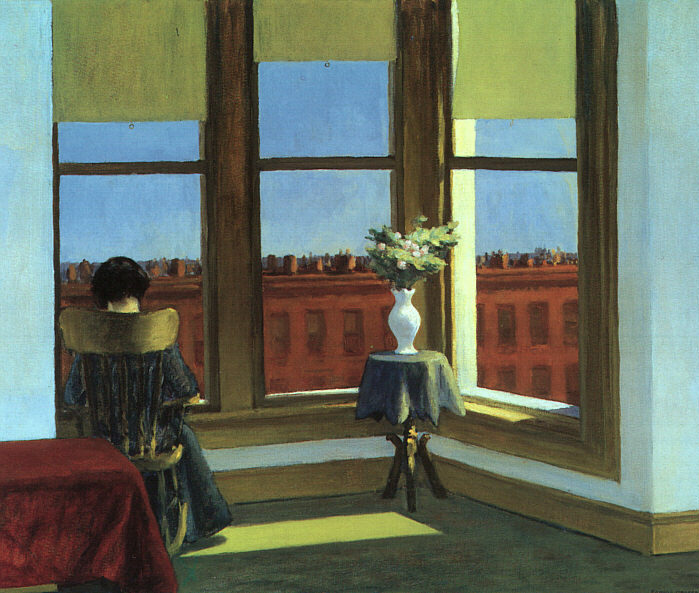 Adding to the mystery is that Hopper later changed the name of the painting to “Early Sunday Morning,” which it’s still known by today. 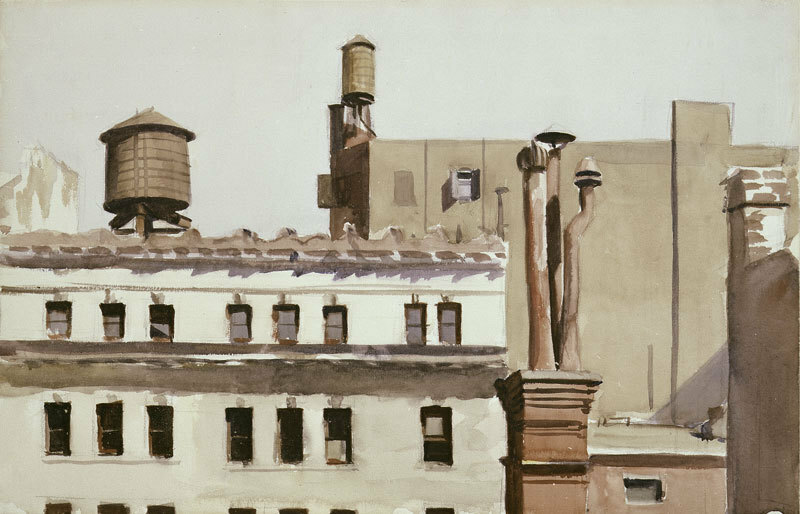 Many of Hopper’s other works—deceptively simple, solitary, often people-free city corners and streets—have been traced to specific locations that still stand. Maybe Hopper did draw his inspiration from this slice of Bleecker Street, or perhaps it’s a composite of details from several buildings. 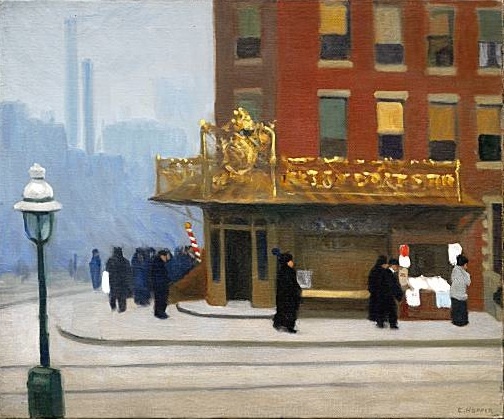 Jeremiah at Vanishing New York has an intriguing take on the “Early Sunday Morning,” as well as a fascinating look at where Hopper’s “Nighthawks” might have been. Where exactly is this 1913 corner saloon? 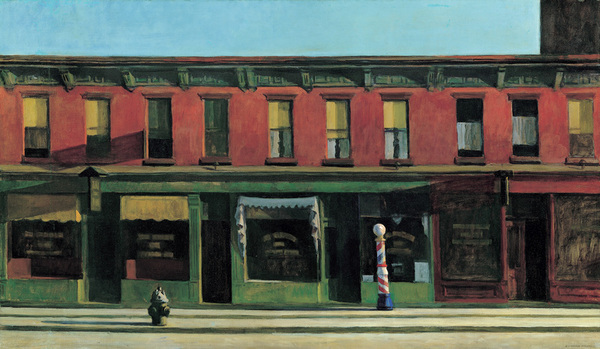 Edward Hopper’s simply titled “Corner Saloon,” from 1913, depicts the kind of regular city bar on an ordinary street corner that makes it almost impossible to figure out exactly where it was located. The smokestacks give a hint: probably by a river. 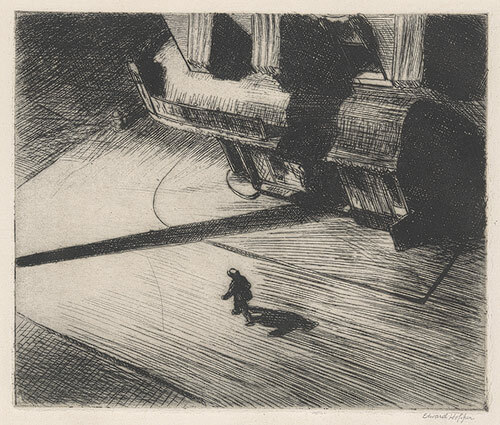 And a caption from the Metropolitan Museum of Art website states that it’s the same corner Hopper sketched in 1921’s “Night Shadows” (right). It’s an “actual location in New York . . . It is a downtown street near the riverfront, marked by a simple brick building with a painted sign,” the Met says. But where? 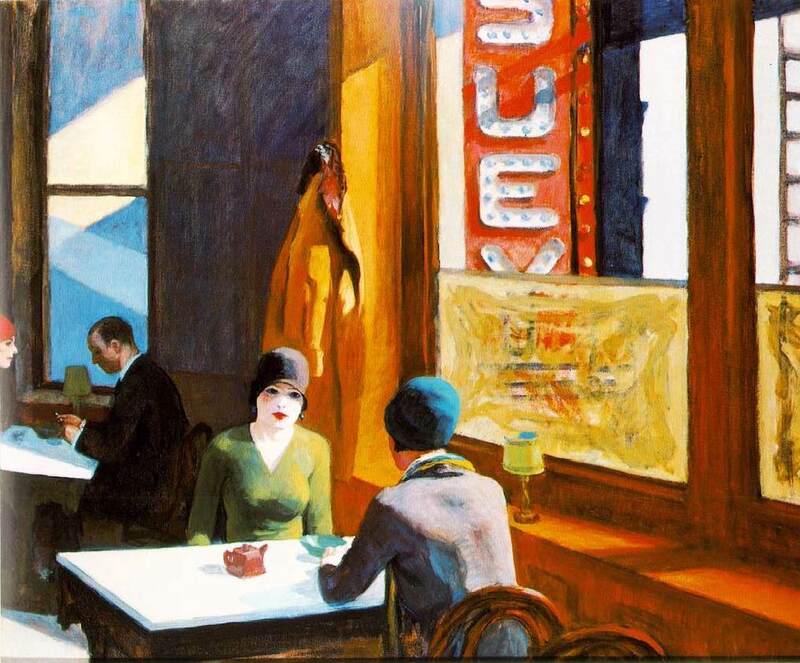 Edward Hopper’s 1929 painting Chop Suey is a reminder of a much older New York, when this dish was advertised in neon outside Chinese restaurants around the city. “These fashionable women are dining at a modest Chinese restaurant not unlike one the Hoppers frequented,” writes the National Gallery of Art. 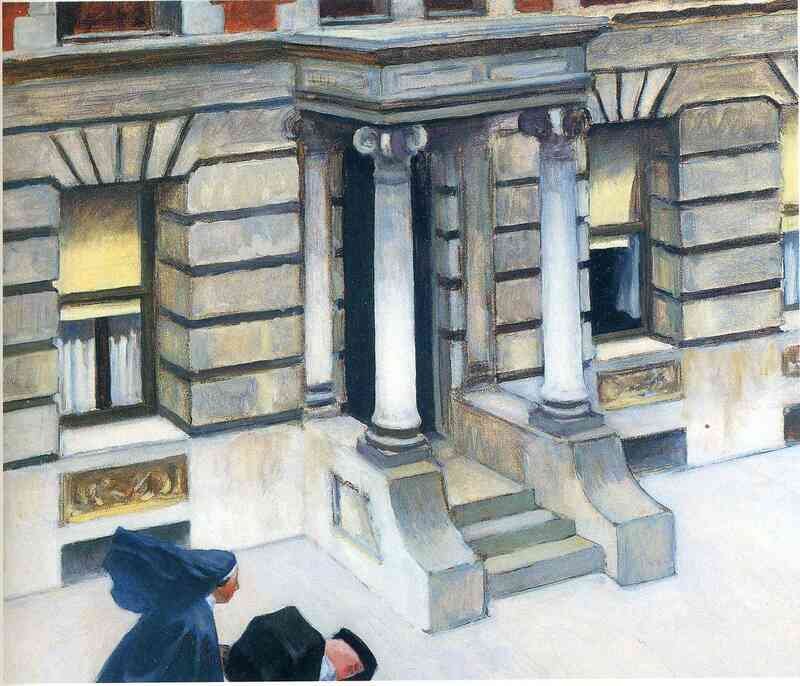 Most of us have found ourselves on either end of this kind of scenario—painted in 1928 by Greenwich Village resident Hopper. 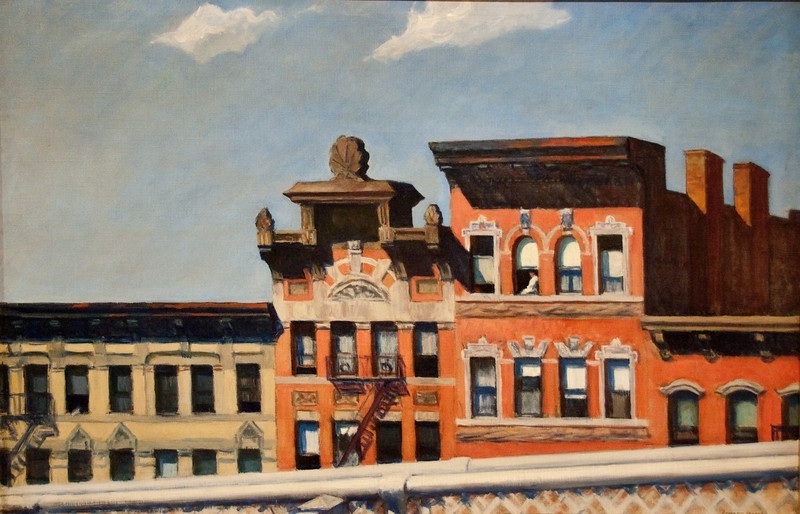 The Whitney has an exhibition of Edward Hopper paintings and prints, as well as those of his contemporaries like Martin Lewis and Reginald Marsh. It runs through April 2011.